Between a Carolina Panthers game and a visit to the Nascar Hall of Fame you have to entertain yourself with the tallest gigacoaster in the world, the 325 foot tall Furry 325 from Carowinds amusement park, visit the biggest lake in NC, Lake Norman, with an 845 miles of shoreline. Being only 30 minutes’ drive from Charlotte, that is if it’s not rush hour, because if it is, your relaxation trip could become a night mare sitting in the traffic for 2 hours like I did. For me it was worth it but for the locals it may be frustrating. The good news they are working to expand the roads. To remain on the nature side of your trip but still in the uptown Charlotte a nice place to spend a quiet afternoon is Daniel Stowe Botanical Garden with 110 acres of gardens and fountains. You will be amazed by how many different species of orchids you will find here. 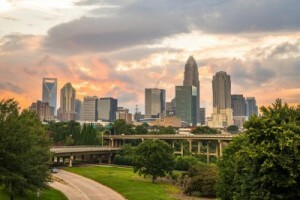 If you are more of an adventures type, Charlotte has something for you also. The US National Whitewater Center will offer you the adventure of your life no matter what is your favorite: water, land or air. White over 17 miles of woodland trails you will be more than happy to explore if you are a runner or a biker you can’t ask for more than that. The 46 foot climbing wall and the zip lines will compete for the air adventure lover’s taste. Did you know that the Whitewater Center has the largest man maid river in the world? You can try the Family rafting if you are a beginner because its focus is on the easier Wilderness Channel or for more competitive levels you can try the Competition Channel. Charlotte has many places to visit that I did not touched yet, but probably will later. If you have a chance to visit the beautiful Queen City, please make time to visit at least a few of this places. You will not regret it.